With social media and search marketing, both trending in the digital news, website design and consumer experience have taken a backseat in mind space. However, these are critical and a first step to getting your digital strategy right. And here is why. Almost every client we have worked with since end-2004 when we first made our website, has wanted to hire our services because they liked what they saw on our website. In 2004 we had very little content that we could showcase as a portfolio. So we put up what we thought we were good at, ideas that looked good and could engage the audience as a part of our user experience design (UED). It worked. 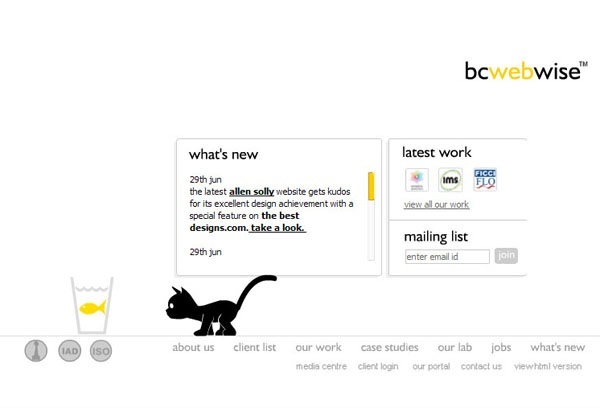 Anyone who visited the website instantly fell in love with the fish n cat animations that we had as a part of the UED. So when we revamped our website in 2011, because our previous site could no longer hold all the content we had, we ensured that the endearing two – the Fish and the Cat continued to be the highlights. What happened before we had our website? The clients we acquired before we made our website, and these included India’s Top 500 companies: Hindustan Unilever (corporate), Yahoo on behalf of Pepsi, and ITC (Foods business) sent in their enquiry to us primarily because they saw the website for a few brands we had worked with at that time ‘Sunsilk’ (the avatar before Sunsilk Gang of Girls activation), Close Up and a few others. Essentially what they saw online helped them decide that we could deliver the goods. Other than HUL, both ITC and Hero Motocorp did not even call for a multi-agency pitch. So what is the point we are making here? The impact that your website can make with your audience via your website is significant and can be decisive for a visitor. If you are a B2C company, then the visual impact, information dissemination, positioning statement, and windows for engagement that you provide for your audience can completely influence the choice they make at the store shelf where your brand hobnobs with competing brands. Adding rich media content, contextual content, using intuitive information architecture, doing usability tests with the actual consumer are all steps to getting your consumer experience right. For a B2B company, the impact you make on the website with visuals, information dissemination, positioning statement, can be further enhanced with customer testimonials, case studies, etc. These can actually help your customer make their selection. They may decide to not even call in a multi-vendor bid. If they have to as a process, influencers can create considerable buzz within their company’s evaluation team based on what they have already seen demonstrated about you on your website. Window Dressing: One of the key triggers that makes you decide on whether to enter a showroom or not, or choose from an array of showrooms one next to each other is what you can see from outside the store. If the store is not welcoming from the outside, however incredible its products may be, the likelihood of you having entered it is negligible. Exactly the same principles applies for the first landing page of your website. Trained Sales Force: You are comfortable in a store where the sales staff treats you in the ‘contextually’ appropriate fashion. They are there but don’t overwhelm you with their help and assistance, or they are there presenting one engagement ring after the other, and may be much more then you asked for because you want to be showered with the attention at this point in time. Similar contextual information dissemination and engagement windows need to be built on your brand or corporate website. Product Showcase: If its games that kids love, then highlight these with brand placement in them. If it is hair styling then give rich media content they won’t find anywhere else. And if it is just statistics that work, then forget the imagery, and give them the facts, present it with tasteful copy. In other words if you are a company all about services that do not involve a product photograph, explore the key USPs that you can highlight creatively: Team, Offices, Clients, Certifications, etc. So in the race to address the multiple channels of the digital domain do not forget your website design, and the criticality of consumer experience. Planned consumer experience can help turn your domain into the most cost effective marketing and sales vehicle. 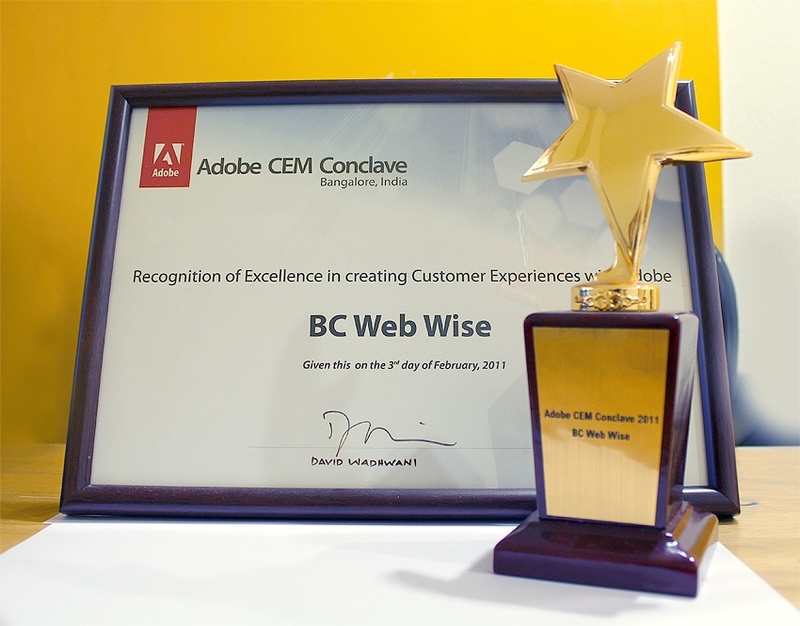 About BC Web Wise & Consumer Experience: In early 2011, Adobe recognized BC Web Wise and awarded us with a beautiful trophy for ‘Excellence in Creating Consumer Experiences’. The other three companies that they awarded with us, were TCS, Infosys and Cognizant. Getting awarded along with organizations that are multi billion dollar companies was the highest honor that we could get, and is one of the most cherished awards we have ever got.